Service Providers globally are actively deploying next generation networks. IMS infrastructure spending is expected to be in line with Voice over LTE (VoLTE) deployments, in the range of $4B by 2022. In order to deliver on this, Service Providers – both wireless operators managing the migration between 3G and 4G networks and fixed operators migrating from TDM to IP/IMS based next generation networks – must manage the transition of their Intelligent Networking features, an installed base that is both substantial and mission critical. Provide a user-friendly application creation environment giving the independence to create and customize applications. Integrates, using REST interfaces and Open APIs, with existing back office billing, management and provisioning systems. Combining these together AGNITY offers a fully specialized SCP replacement practice – one that has been put to the test in commercial deployments with some of the world’s largest Service Providers. Intelligent Network (IN) architecture has been in place since the early 1990’s and fills a critical need for delivery of complex call flows that cannot be managed by traditional switching infrastructure. As networks evolve, so must capabilities of IN. A robust IN platform is a complement to next-generation core network call routing capabilities. Whether that is a SIP-based VOIP network or an IMS-based mobile network, Intelligent Networking is a requirement. And far from being simply legacy services that need to be perpetuated, IN services continue to evolve. Your IN platform needs to be future ready. New service offerings: The concept of IN has always been to incorporate complex decision logic into network call routing processes. The telecom world has evolved and today more and more databases that used to be proprietary are accessible “online” – this allows additional information for routing decisions. In addition, new external resources are available to the Service Provider –speech recognition, biometric authentications, fraud detection, etc. all of which open up new service offering possibilities. Evolution of Networks: As networks migrate from TDM to IP call flows supporting specific services also need to be modified. Subscribers need to be able to access services and resources previously available on the TDM network from the SIP network and vice versa. Without flexibility, the network becomes tangled in “hairpin” call flows adding complexity and cost. Simple Platform Evolution: Legacy SCPs are reaching the end of life and in many cases do not support the required network interfaces. In addition, frequently services reside on multiple different platforms. The need to evolve and consolidate to a single next-generation platform is not just good planning for the future – it is also often a necessity for the present. The AGNITY solution is comprised of multiple parts. 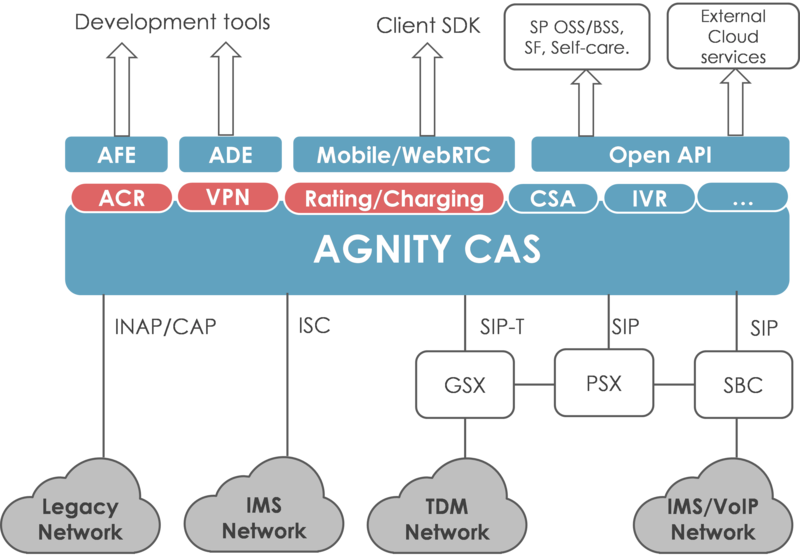 Software Platform: AGNTIY Communication Application Server (CAS) is a carrier-grade NFV ready, multi-network and multi-service platform for optimizing CAPEX and OPEX across legacy and next-generation networks. It offers an open programmable, flexible, extensible environment for applications and easy interworking with external resources such as media servers, speech engines, and databases. It Provides Open API that allows easy integration with existing OSS/BSS, self-care systems, and external cloud services. Base Applications: AGNITY offers a number of “base” applications comprising the fundamental IN capabilities (e.g. ICR, Voice VPN, Real-Time Call Rating and charging, etc.) Depending on the call flow scenario these apps work in either B2BUA or redirect mode, the application business logic is customizable without any need for code changes at platform layer. These applications are commercially deployed and are the base that we use to easily replicate existing IN services and create new ones. 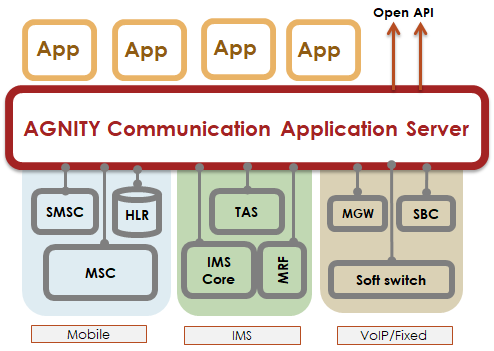 ICR Application: The most fundamental IN capability is Intelligent Call Routing (ICR). AGNITY’s ICR offers multiple decision node types (ranging from basics such as time of day and originating number to more sophisticated such as external DB query and call recording) and the Application Flow Editor (AFE), a web-based GUI for programming routing flows based on these decision nodes. This highly flexible application can easily be integrated with external resources ranging from basic media functions to more sophisticated speech processing and analytics enabling various use cases such as IVR, fraud control, customer interaction analytics and more. Interactive Voice & Video Response (IVVR) as the name suggests it’s a combination of interactive voice and video that adds the functionality of the application and gives a better experience to the end users. It enhances the self-service capabilities and provides an additional means to deliver a multi-modal experience incorporating audio, video, images and textual information end users. As IVR’s are no more just play recorded messages and DTMF capture but now they encompass video, complex call routing, high definition voice, speech recognition, keyword detection, and even biometric capture and recognition. Over that, there are numerous technological, operational and economic factors that collectively strengthen the requirement of IVR replacement. Service Providers have to address these requirements and migrate to a new solution that can offer these additional features and provide a new platform for evolution. This is where AGNITY comes to the rescue. At AGNITY we have tremendous experience in migrating complex legacy applications to next-generation networks. AGNITY offers following advantages making it a reliable partner for IVR replacements. It offers a programmable, flexible, extensible environment for applications and easy interworking with external resources i.e. DB, MRF, ASR, TTS, Payment gateway, Email Server, etc.